I prefer to build Qt from source. I have been trying to build Qt 4.8.5 on Mac OS X 10.9 (Mavericks). I managed in the end, but it took a few tweaks. Online information about how to do this was fragmentary, so I am documenting it here in case it is useful to someone else. 2. The corewlan plugin doesn’t build. I don’t need it (I think, I’ve never heard of it before) so I disabled it using this fix from stackoverflow. There will be lots of warnings that Qt 4.8.5 isn’t compatible with Mac OS X 10.9. But you can ignore these (or comment out the warning in the appropriate Qt header file). Qt 4.8.6 has been released. This appears to build fine on Mac OS X 10.9. This entry was posted in MacOSX, qt, software and tagged build, configure, mac, mac os x, Mac OS X 10.9, mavericks, Q, qt 4, Qt 4.8.5 on 16 January 2014 by Andy Brice. We have had loads of snow here in the UK. Loads by UK standards anyway (I don’t think a Scandinavian would be very impressed). So I decided to take full advantage of the flexibility my job allows and build an igloo. It was my second attempt and it turned out much better than rather wonky one I did a few days ago. This post is a quick overview of the modest amount I have learnt about igloo building, in case you are inspired to build your own. First of all, building materials. The snow needs to be the sort you can squash together to make a snowball. If it is too powdery to stick together, forget it – you won’t be able to make a worthwhile igloo. Try again tomorrow. Next you need to mark a circular base for your igloo. If you don’t then it is hard to get a decent overall shape. Two twigs and a bit a string is all you need to draw a circular outline. Don’t be too ambitous though, it takes a surpising amount of snow to build an igloo and the amount goes up fast as you increase the diameter. 1.5 to 2 metres diameter is plenty for a first attempt. Then you need to have a bucket-shaped receptacles in a range of sizes. I used a household bucket as the largest, 2 different sizes of flower pot and a child’s bucket as the smallest. Start with the largest receptacle. Use it as a mould to create ‘snow bricks’. Pack the snow into the mould tightly to make strong bricks. Lay a circle of these bricks as close together as possible, leaving a gap for the door. Then place the next layer of bricks on top, interleaving them like standard brickwork. Pack the gaps between the bricks with loose snow like mortar in brickwork. Every few layers you need to swap to a smaller mould. Each layer needs to curve inward a bit more than the previous one to form the dome. It is quite surprising how easy it is to build an arch out of snow. It is stronger and stickier than you might think. It took 3 adults a couple of hours to complete the igloo. I don’t think the Inuit will be offering us a job anytime soon, but it was very satisfying. Considerably more satisfying than the several hours I spent this morning failing to work out how to get rid of a maximise icon in Mac OS X. 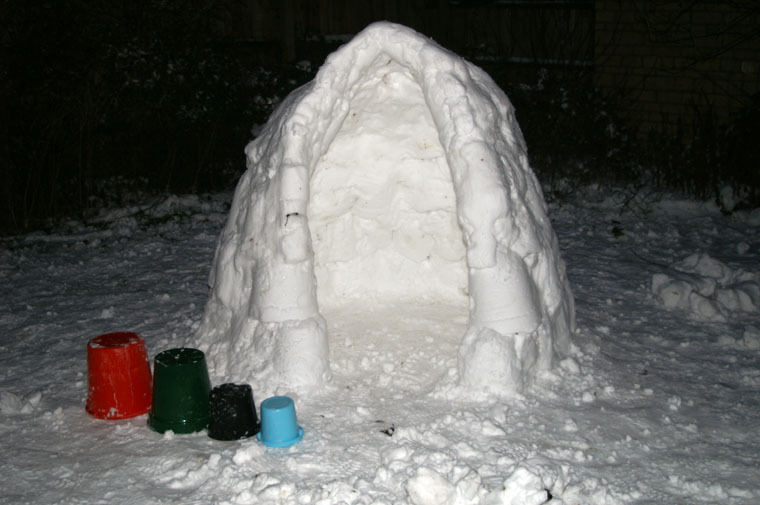 This entry was posted in off topic and tagged build, how to, igloo, snow on 13 January 2010 by Andy Brice.